A method for analysis of thin film thickness in spectroscopic reflectometry is proposed. In spectroscopic reflectometry, there has been a trade-off between accuracy and computation speed using the conventional analysis algorithms. The trade-off originated from the nonlinearity of spectral reflectance with respect to film thickness. In this paper, the spectral phase is extracted from spectral reflectance, and the thickness of the film can be calculated by linear equations. By using the proposed method, film thickness can be measured very fast with high accuracy. The simulation result shows that the film thickness can be acquired with high accuracy. In the simulation, analysis error is lower than 0.01% in the thickness range from 100 nm to 4 um. The experiments also show good accuracy. Maximum error is under 40 Å in the thickness range 3,000-20,000 Å. The experiments present that the proposed method is very fast. It takes only 2.6 s for volumetric thickness analysis of 640*480 pixels. The study suggests that the method can be a useful tool for the volumetric thickness measurement in display and semiconductor industries. A. Piegary and E. Masetti, “Thin film thickness measurement: a comparison of various techniques”, Thin Solid Films 124, 249-257 (1985). T. E. Benson, L. I. Kamlet, P. Klimecky, and F. L. Terry, JR, “In-situ spectroscopic reflectometry for polycrystalline silicon thin film etch rate determination during reactive ion etching”, J. Electron. Mater. 25, 955-964 (1996). T. Kihara and K. Yokomori, “Simultaneous measurement of refractive index and thickness of thin film by polarized reflectances”, Appl. Opt. 29, 5069-5073 (1990). U. Schnell and R. Dӓndliker, “Dispersive white-light interferometry for absolute distance measurement with dielectric multilayer systems on the target”, Opt. Lett. 21, 528-530 (1996). D. Kim, S. Kim, H. J. Kong, Y. Lee, and Y. K. Kwak, “Fast thickness profile measurement using a peak detection method based on an acousto-optic tunable filter”, Meas. Sci. Technol. 13 (2002) L1. J.-W. You, S. Kim, and D. Kim, “High speed volumetric thickness profile measurement based on full-field wavelength scanning interferometer”, Opt. Express 16, 21022-21031 (2008). Y.-M. Hwang, S.-W. Yoon, J.-H. Kim, S. Kim, and H.-J. Pahk, “Thin-film thickness profile measurement using wavelet transform in wavelength-scanning interferometry”, Opt. Laser. Eng. 46, 179-184 (2008). M. Urbánek, J. Spousta, T. Běhounek, and T. Šikola, “Imaging reflectometry in situ”, Appl. Opt. 46, 6309-6313 (2007). 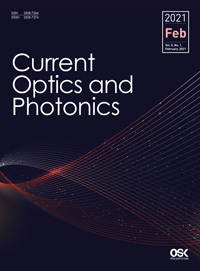 M. Ohlidal, I. Ohlidal, P. Klapetek, D. Nečas, and A. Majumdar, “Measurement of the thickness distribution and optical constants of non-uniform thin films”, Meas. Sci. Technol. 22 (2011) 085104. K. Kim, S. Kim, S. Kwon, and H. J. Pahk, “Volumetric thin film thickness measurement using spectroscopic imaging reflectometer and compensation of reflectance modeling error”, Int. J. Precis. Eng. Man. 15(9), 1817-1822 (2014). S. Kwon, N. Y. Kim, T. Jo, and H. J. Pahk, “Critical dimension measurement of transparent film layers by multispectral imaging”, Opt. Express 22, 17370-17381 (2014).